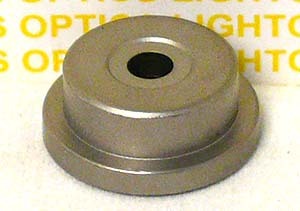 These New Focus 9910 Post Holder Pedestal Bases are part of New Focus's modular Pedestal System. This part is held with a New Focus Fork mount, allowing placement of one of their Pedestals anywhere on your optical table or breadboard. The top hole is drilled and tapped 1/4-20 to fasten to posts or post holders. Made of Stainless Steel.